I have two young kids and young kids love Disney movies. One of Disney movies that I admit I can’t remember ever watching all the way through is Bambi. I had the pleasure the other night to watch Bambi all the way through with my daughters and I thought it was a pretty good movie, although maybe not for the younger kids but it certainly can teach us a few things about life. Here are the lessons I learned from Bambi and his struggles. We all have to learn to walk for the first time. It may be difficult, and it will certainly look pretty funny to those around us but its necessary and everyone has gone through it. As we learn to walk and experience the falls and pain, we grow and learn other valuable lessons about life. Just when you think you know how to walk and are pretty mobile, the conditions around you change and you are unable to find your footing anymore. From there, you have to pick yourself back up and relearn your most basic activity again. Look at the economic downturn, we all thought things were going great and we knew what we were doing. One day, we woke up and the market is in the toilet, everyone is crying depression, and the forecast is black. But what do we do? We get back up and start learning our most basic activities, like saving, frugality and debt reduction. That’s how survival works. You can’t control your surroundings but you must deal with them as they change. First Bambi is a little, care free deer, running wild in the meadow. Then, his mother is shot, now what will he do? The next time you see Bambi, he is grown and struttin’ his stuff. He meets a girl and after that first kiss..or lick, he’s walking on clouds. The next thing you know, hes fighting for his girl from Ronno, the other deer who looks and acts much tougher than Bambi. He defeats the other guy and stands triumphant..for about ten seconds. Then his forest is on fire..as you finally think Bambi may be safe, the hunter comes with his 50 hunting dogs! As Bambi is escaping with his Chica, he’s shot! But in the end, Bambi and Faline get to roll in the hay and have twins. You never know what life will throw at you. Just when you think things are going great and you couldn’t be happier, life throws you a curve ball and you strike out. Then when you think everything is going horribly, you might just catch a break. Bambi was in no way prepared for any of these events, good or bad but took them as they came. 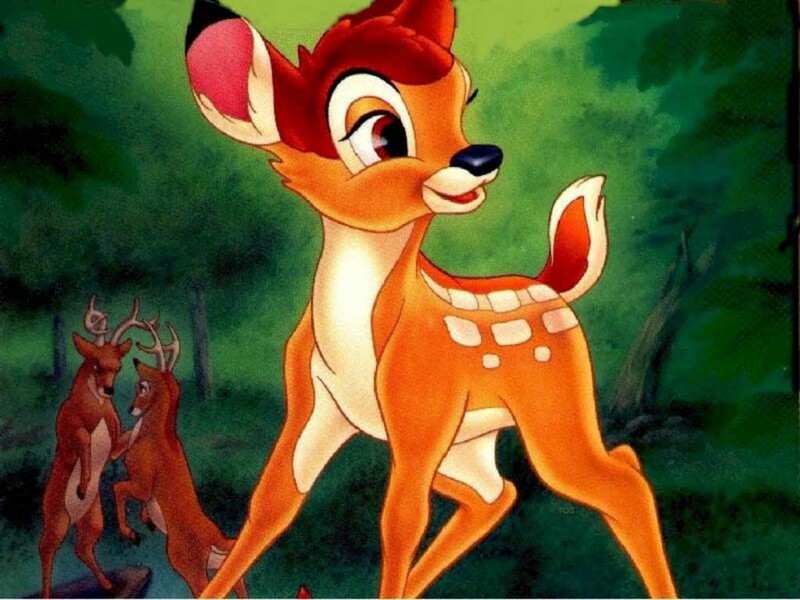 Bambi may not have had the foresight to prepare for these things ahead of time, but as he was thrust into the events in the movie, he learns and grows. Could he have fought off the hoard of dogs if he hadn’t had a little experience using his antlers and fighting? No, so thanks to Bronno, the, might I say..anxious male deer, Bambi was able to save his girl by fighting off the dogs. If Bambi’s mother hadn’t died and Bambi had never experienced that hardship, would he have had the courage to fight Bronno in the first place? Probably not. Every event in life brings us knowledge and experience. These events prepare us for the next hardship life will bring. 4. Don’t get emotionally caught up in your finances. In the movie, there is a scene where all the animals are running and hiding because the hunter is coming. One especially nervous quail gets herself all worked up and freaks out. She flies out of hiding and..Bang..she’s dead. Her death leads to a frenzy, all the other animals freak out and leave their hiding places. Finances and emotions need to stay separate from each other or you may just get worked up enough to freak out and come out of hiding. Lots of professional traders fell into the trap of emotion when the market was crashing. They freaked out and sold all their assets as the market hit the bottom. Many people lost a lot of money because they couldn’t keep their emotions in check. If they had their wits about them instead of their emotions, they could have calmly assessed the situation and changed their plans to accommodate the problems. There is no way Bambi could have known his mother would be shot down in the meadow just like there is no way we can know what emergencies will come up in our lives but we can prepare the best we can. Having any kind of emergency plan and emergency fund can help us at least a little if something comes up. Maybe the $1,000 emergency fund can’t cover our emergency medical bills, but it’s a lot better than having zero in the bank and having to cover those same costs. You can’t know when you’re metaphorical mother will be shot down but you can prepare in case she is. Good analogy, first you really do need to learn how to walk before run with finances. Because you could seriously put yourself in debt and in trouble if you take off too strong without knowing how it can affect you. .-= Craig´s last blog ..Personal Finance Twitter Chat on Wednesday Dec 9th =-. Exactly. The scene with Bambi wobbling back and forth both at birth, then on the ice later in the film show just that. You can’t start running till you can walk. Thanks for your comment Craig. Believe it or not, but I think #4 is the most difficult advice to follow. We are emotional beings and money certainly elicits strong emotional reactions in most people. No wonder since it is the basis for our survival and livelihood in US society today. ctreit, absolutely. Even those of us that focus all our energy into proper finance management get freaked out by things, like I mentioned the pros on wallstreet. Of all people, they should know the market fluxuates and would most likely come back up, but it’s hard to keep cool. Jesse, this was so good it made me cry. I posted it on the family website, too. Hope you don't mind. Thanks Mom, I don't mind at all. Excellent advice presented in a truly creative manner. I agree wholeheartedly with #5, which is also one of our program’s five fundamentals. You must prepare for rainy days, you never know what is down the road. A good way to prevent debt is to prepare against it. .-= DJ´s last blog ..Great Resources for Energy Savings =-. What a goofy picture of Jesse. Thank you for your comment DJ, and welcome! I agree with your statement about preparation. Some things simply can’t be avoided but good preparation can at least lighten the blow. Very interesting and enlightening post! As I was reading it though all I could help was think… there sure is a lot of death in Bambi for it to be a kids move LOL. I do think the worst thing anyone can do is to let one glitch in their financial situation spiral them out of control. It’s all about keeping things contained and staying on track. but you’re right, contained and on track. Freaking out only stresses you and everyone else out. The learn to walk analogy is one of the best ones for life in general :)…. No good knowing about calculus if you can don't basic math!!! My recent post Is Minimalism a worthwhile form of activism? Thanks Forest, it's just too bad too few will ever try to walk in some areas that they really should, like finance. \”It's just too hard..\” right? 🙂 but they will try their hand at the \”calculus\” of that world, like investing without knowing the basics which causes disaster. Absolutely, we all need to do the groundwork. I must say finance is an area I am not amazingly good with so have not delved into investing or such things yet…. I am learning slowly though.